This has been a really busy but really wonderful week. The daily salads are definitely working - I'm feeling healthier, and the scale is moving in the right direction. I woke up Tuesday morning and saw 254 - the lowest number I've seen since before Noah was born! We've been planning this for a little while now; it was just us at the courthouse with Noah and one of Matt's brothers, who served as photographer and babysitter. And it was absolutely perfect. I'm heavier than I would have liked to have been at my wedding, but in the pictures, all you can see is how happy we are. I want to remember that, and not the size of my dress. I will remember the joy and the happy tears and the kiss, not how upset I was in the days leading up to it all, hoping I'd miraculously lose 50 pounds overnight. Something that consistently breaks my heart is remembering my dad saying that he was eating salty restaurant takeout despite it going against his dietary plan because his focus was on "quality of life, not quantity." So I wasn't sure what I would do about eating on Tuesday - it was my wedding day, but it was still just a day, and I knew the things I wanted to eat that day would be contrary to my goals. In the end, I decided that as long as I had a plan, the day wasn't a problem - binge eating snack cakes is an issue, but enjoying one piece of my own wedding cake isn't. And the next morning, we were right back on track. I figured, if I live to be 75, that means I'll be alive for 27,393 days. If I could only have champagne and cake one day, I'd want it to be this day. I let go of the guilt, and I moved on. Wednesday morning, my weight spiked up, but after a day of getting back into my salads and minimizing processed carbs, it started back down. I'm pleased, and ready to keep going. Matt and I both recognized that while the wedding dinner I made was delicious, afterwards, we felt horrible, bloated, weighed down. Our salads have been delicious too, and they don't leave us feeling like this. So getting back on track was quite easy. I'm glad to have someone so supportive and encouraging for a husband. I'm feeling motivated to eat better, and after going with Matt to his late evening group run with a local running club, I'm feeling inspired to start running again. Today I finally get paid, so I can get a new pair of running shoes (my old ones have holes worn through them). It was a great week, though a busy one (on top of getting married, I gave 5 exams [and now have 100+ exams to grade] and Noah started eating real food! ), so I didn't get a chance to share some salads. I promise I'll get on that early next week! What about you? How was your week? Any fun plans coming up? Congratulations to you, Matt and Noah. I wish you all the best for your future. You deserve it. Did Noah wear a little suit? Congratulations Mary and to Matt also. You guys make such a great couple and look so happy together. I've been overeating and not feeling that great. Still in the fight though. I'm on vacation next week so looking forward to much needed rest. Congratulations! You look so beautiful Mary, your joy is radiant and even if you weren't the weight you wanted to be you couldn't tell because your happiness shines through that. Absolutely stunning! congratulations to both of you! I wish you a lifetime of love and happiness!!! YAY!!! Congratulations!! That is such exciting news! I'm just overjoyed to see you so happy and loving life! Congratulations Mary!! Your words always seem so happy when you speak of Matt and the family that the two of you have made. I'm so very happy for you! I know that you are still in the process of weight loss, but after following your blog for over a year and seeing where your life was then and where you are now, I have to say that you are on the best track possible! Congratulations! What a wonderful and blesssed week! I'm so happy for you! 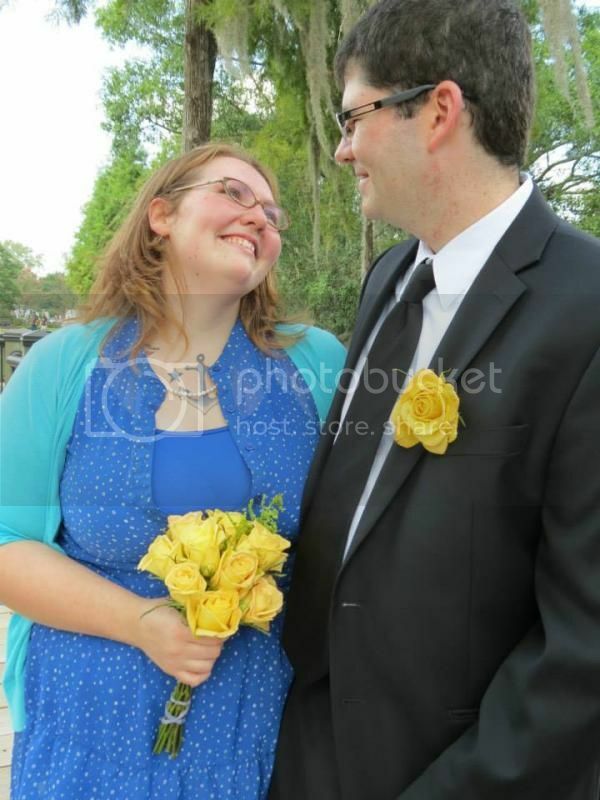 I just got married on Aug. 13th. I'm also recovering from my celebrating. Congratulations Mary! What a happy day for you! You look so happy in that picture. What a great family you have. Congratulations!!! I love that you got married in such a spontaneous, (hopefully stress-free) way! Due to some last minute issues, my husband and I got officially married a few days before our wedding with just my sister and one of his best friends there. It was so amazing to have it just be us so we could take a while to focus on our future lives together. congrats! that's wonderful and you're right one day to celebrate a once in a lifetime event certainly wont stop your progress! Congratulations! The best thing that you're doing is to focus on the positives about your wedding day. Speaking from experience, it makes the memories so much better when 10 years later, you only remember the great moments! All the best! What a lovely post-- congratulations! Congratulations! This is such great news! I am so happy you guys made the best of it!! Also so exciting about your sister too!! CONGRATS!!!!!!! You look gorgeous and SOOO happy! Congratulations - you are such a beatiful bride! Congratulations! You and Matt are an inspiration.